Following on from the extremely popular Evergreen outdoor pool table, the Evergreen Classic retains the style and quality of the original! As you'll be able to see from the pictures, the Evergreen Classic features a unique bar leg design, built specifically for outdoor pool tables, which can even stay level on grass! This great design also makes the addition of bench seats even easier as there is now much more room for legs and feet under the table. 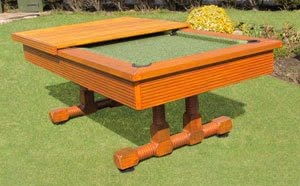 This means you can combine the fun of a pool table with the practicality of a functional piece of outdoor furniture. The Evergreen pool table is supplied as standard with 2 cues, 1 set of red and yellow pool balls, a triangle and chalk. There are many additional pool table accessories available to augment and increase the enjoyment of your pool table.